It came to me in the form of the above tweet I saw yesterday. In a hundred and forty characters or less (I’m not going to bother counting), Mr. White’s laid his finger on a deeply troubling divide in the world of comic book adaptations. The raccoon with a machine gun is Rocket Raccoon, set to make his onscreen debut in Marvel’s Guardians of the Galaxy next year. Wonder Woman is, theoretically, the third part of DC’s so-called “Big Three,” even though editorial attentions would suggest that the Flash or Green Lantern better fits the title. One is a prominent heroine with a history of troubled adaptation attempts, while the other is a relatively obscure character getting major studio support on his first try. To date, Wonder Woman has but a few successful properties to her name, the majority of those Justice League pieces where she’s just a part of the ensemble. In some cases--notably Justice League Unlimited--she’s one of the best cogs in the machine, while others don’t really use her as much more than the token woman. In the past three years alone, there have been two failed attempts to adapt her to network TV, and the famously feminist Joss Whedon eventually had to dismiss himself from writing and directing a feature film based on the character, citing a lack of studio support for his vision. The crazy thing is, though, Wonder Woman’s not actually that complicated at all. In fact, there’s precious little to separate her character from Thor’s; both are warrior figures straight out of mythology books, plunked into the modern world toting some big badass magical artifacts. One of those two characters has a pair of movies in what’s presumably going to be a trilogy someday, not to mention an appearance in the third-highest-grossing movie of all time and an appearance in that movie’s sequel. The other one is Wonder Woman. And of course, the simplest answers are so often the best ones. The continuing success of franchises like Buffy the Vampire Slayer and the recently launched all-female X-Men prove there’s a thirsty (and possibly growing) market for female-driven superhero stuff. But for every step forward you get, there are reminders that something as funny and true as the Hawkeye Initiative exists for a reason. Things are hardly better when you get past the source material and into the movies they’ve become. The X-Men movies aren’t terrible on the surface, but the third one took Jean Grey, the most powerful member of their cast, and essentially turned her into a football to be tossed from one side to the other while the men of the cast got to posture impressively and spew platitudes until one side rolled over dead. Meanwhile, Black Widow got to do some cool things in Iron Man 2 and The Avengers, but most of it was spectacle. Whedon does his best considering her limited powers (which is a whole other column in the offing), but the truth is that Widow is even less essential to The Avengers than the archer that spends half the movie as a bad guy. And that’s to say nothing of Catwoman in The Dark Knight Rises, who spends the film scurrying to the protection of one man or another. In fact, it’s troubling but true to say that the only comic book movies where the female leads show any true agency are Catwoman and Elektra, which both rather sucked. 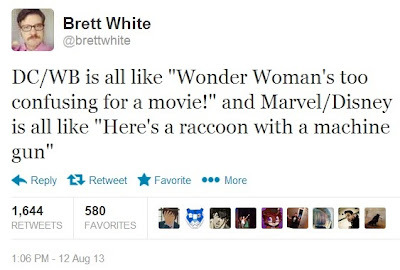 But attempting to use those as proof that women can’t carry superhero films ignores the existence of both Ghost Riders, all three Punishers, Daredevil, both Fantastic Fours (where Jessica Alba really was just there to look good), Green Lantern, and a variable number of the Spider-Man, Batman, Superman, Blade, Hulk, and X-Men franchises, depending on which fan you ask. Several of those were commercial flops, and most of them were critical ones. So if women have gotten the keys taken away from them for crashing the bus into a ditch twice, what the hell is it going to take on the male side of things? Now, DC’s got a new project in the works: the recently announced Batman/Superman movie, which will presumably be the next barefoot step on the broken-glass-paved path to a Justice League movie. So for two-thirds of DC’s Big Three, that’ll make it seven films for Superman and eight for Batman. As for that third one, let’s put it this way: in our respective lifetimes, Wonder Woman and I have had the exact same amount of movies made about us. I love geek culture and I’m a proud part of it. But it’s always had a discomfiting undercurrent of casual misogyny, of which this ridiculousness is only one example. They’re not even pretending to develop a solo project for her right now; the best for which the character can currently hope is that the CW’s Arrow will throw her a bone in its upcoming second season. Who knows? Maybe Wonder Woman will be in the Justice League movie. You’d think it’d be a given. But then again, you’d think her getting the respect she deserves would be a given, too.